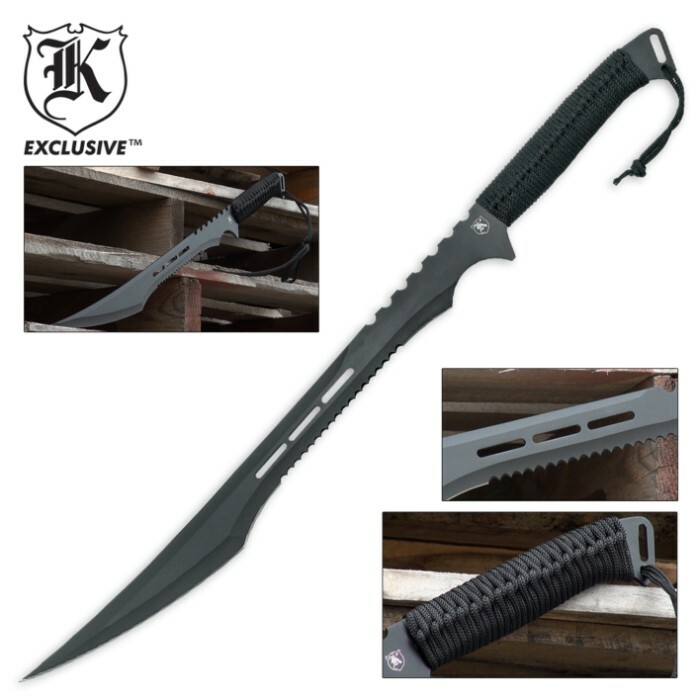 Secret Agent Tactical Ninja Sword with Shoulder Harness Scabbard | BUDK.com - Knives & Swords At The Lowest Prices! 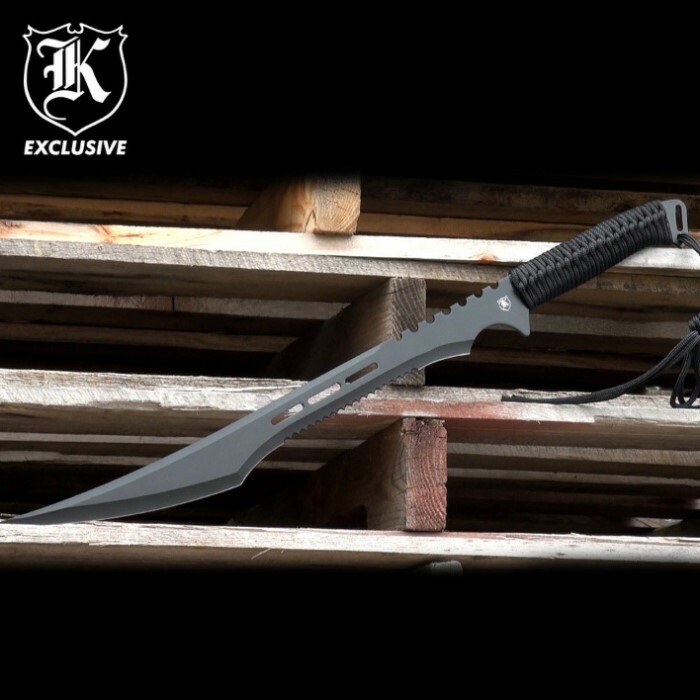 This Secret Agent tactical sword is one awesome piece of steel! The sleek full-tang design measures 27" overall with a heat-treated black baked finish. The blade features fantasy cutouts, teeth-like serrations, a piercing point and slides smoothly into the included nylon sheath. The nylon cord-wrapped handle adds a sure grip for easy maneuverability. If there is a sword that screams to be picked up, this one is it! This is a light duty sword and as long as you know that fact upfront,you will not be disappointed. It has a good look and a reasonable price,so I would recommend it. I bought one several years ago. As soon as I opened the package I was a little let down. It was balanced well, but too thin for my liking. I used it mostly for hacking weeds and bushes in the yard, worked great at that, but one hit up to close to the handle and it snapped in half. If they make a thicker one I would definitely buy another. very light and sharp, blade isnt that thick but for me thats a bonus. Tied into the molle webbing of my bug out bag adding little weight with a nice increase in capability. I wrapped the grip in hockey tape, this is a easy fix to the paracord issue that plagues swords in this category. Im not sure why people complain about the grips when it can be solved so easily. Heck, its fun to make your own custom grips on these things, I use the orange para cord but thats just me. 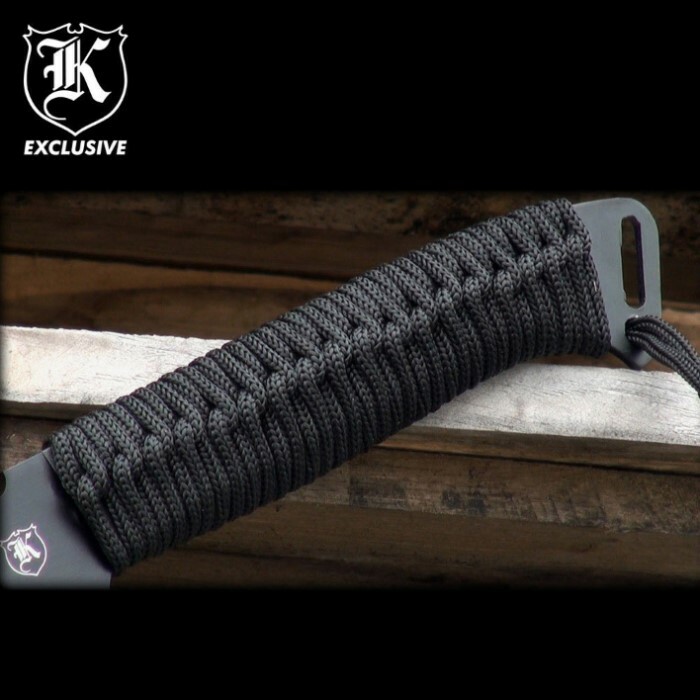 A perfect utility sword for the back country, so light you wont even know its there. Swords great. As soon as i put the blade in the shealth it ripped the side stitching out. I wanted to give this product a more thorough review. I am a martial artist with some weapons training. I bought six of these. These blades are great machetes. I have one that I use and abuse to test it's capabilites. To be good swords they need a bit more steel on them in terms of thickness and weight. The scabbards like everyone else's reviews are not very good. Some of the blades are extremely sharp and cut through the stitching on both sides of the scabbard. The rivets are the only things keeping them together. If they were made from a stiffer material like glass filled nylon or leather they would be perfect. Glass filled nylon with a molle system would be very useful as well. Some of the points were dull. I resharpened the edges and reshaped the points and work great. The wrapping on the handle is flimsy, but if you rewrap it and apply some heat it will harden the outside and prevent from slipping and come undone. Melt the end where it is tied off stop it entirely. This product still gets five stars from me. I enjoy using these blades. Just wish China didn't make them. U.S. would do a much better job and sold for much more.